I have decided to take a break from my Olympics saga. I was beginning to feel like I was writing a term paper. Many of my friends have gone to Disneyland this summer. Because of that, I thought I would share my last trip to Disneyland. Even though it was almost 10 years ago, it is still one of my favorite vacation experiences. 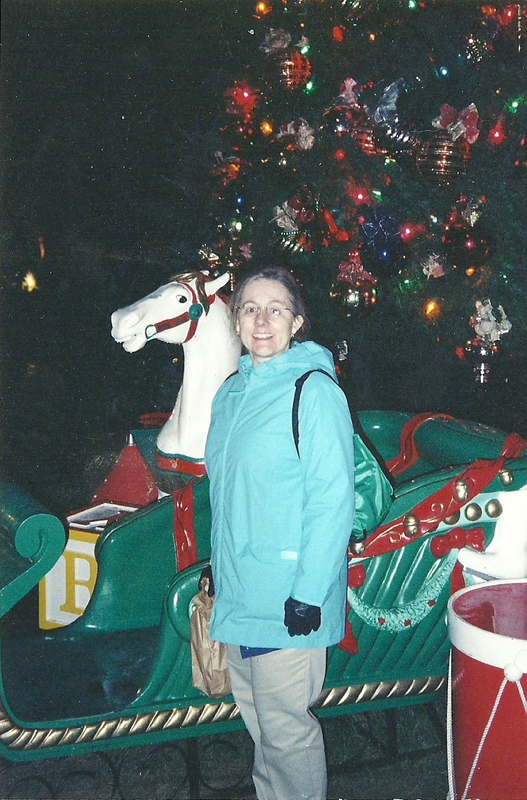 We went to Disneyland in December of 2003. One thing I wanted to do is fulfill a lifelong dream of staying at the Disneyland Hotel. I also thought it would be nifty to go to Disneyland at Christmas time. I went ahead and booked the room in September. I also tried to book dinner on Christmas day at the main restaurant of the hotel, but it was already booked solid. The next opening was after we would be leaving. I guess they were right in the brochure when they said “make reservations early.” I looked at that as just a minor little setback. But then in November, a major setback occurred. Disneyland sent my final trip package. As I looked at it, I saw that I had listed us as checking out on Christmas day! Yikes and Egads! My life long habit of thinking Santa and the shepherds and 3 wise men showed up on the 24th of December had reared its ugly head again. I rejected my immediate impulse to call the hotel and make it seem like it was their fault and went with the plan of calling them up and throwing myself on their mercy, maybe even shed a tear or too if need be. It was only about a month until the trip and I figured they might not have any wiggle room to change my dates. The young lady I talked to could not have been any nicer. The best deal she could do was re-book me through the 26th, but we would have to check out of our room on Christmas day, then immediately check in and get moved to another room. This room would also be an upgrade to a mini-suite with a view of the park. This would also mean an additional charge for that last day. I didn’t care. I would have taken a room in the basement just so I could stay that extra day. The hotel did say they would help us move our luggage to the new room, which I thought was a nice touch. We arrived at Disneyland. I went to the check-in desk and followed all the instructions I had received back in November. The check-in girl got all my information and informed me that she needed to go into the back office for a few moments. Of course when she says this I immediately start preparing myself for any and all worse case scenarios. Now I am one of those people who need to check in at a special window, all the while watching the people smart enough to know that Christmas is on the 25th check in with absolutely no problems. Finally the girl came back. There was a new change in the arrangement. We weren’t going to have to move to a different room after all, we would be in the same room the entire time. Thank you for choosing the Disneyland Hotel. Of course I was extremely happy that the hotel had been able to come up with a way to keep us in the same room, but I was a bit disappointed at not getting one day in a room with a view. I was looking forward to having one for a change. We get to the room, and much to our surprise and delight, the Disneyland Hotel had decided to put us into the room with the view for 3 days at no extra charge. I started pinching myself because this kind of stuff never, ever happens to me. It was a great way to start the trip. The last time we visited Disneyland, it did not have The California Adventure Park or the Downtown District. Lots of new things to get out and see. If there was any drawback to the trip, it was the weather. It was cloudy and raining off and on. Not a hard, driving rain, but mostly drizzle. I do not know if this rain kept people away from the fun park, but the place was not at all crowded. The last time we were at Disneyland, the park set a record for attendance. People would get on their knees and pray and give thanks when they finally reached the sign that said “Your wait from here is 45 minutes.” One of the nice things that Disneyland has are many cool distractions to occupy a person’s time while waiting in line for such a long time. I did not have time to look at these attractions. The longest we waited in line for a ride was maybe 10 minutes. I do remember jogging almost all the way through the queue to get to the Indiana Jones ride, the line was moving that fast. It was on the day that we went to the California Adventure park that I came to the conclusion that little kids were mischievous and the wife was good at getting payback. California Adventure has this ferris wheel where the people ride in cages. One can ride a stationary cage or a cage that is released and slides around and does all sorts of nasty, scary stuff. We got on it and rode with a mom and her two kids. We had a choice to ride on the safe and secure red cars or the movable, slippery and slidy cars. Oddly enough, the wife insisted we ride on the cars of death. At this point in the narrative, let me tell you something personal about Timmy Poole of Poole Photography Studios; I HATE heights. No, I LOATHE heights. No, I DESPISE heights! A side story here to prove the point. 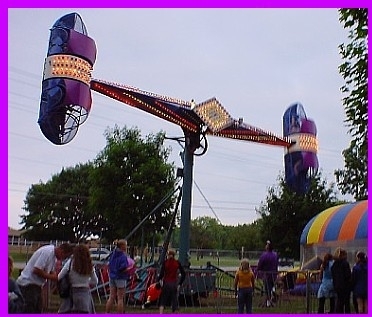 There is an old carnival ride called The Bullet. At a small fair in Prescott, AZ, the summer of 1970, a friend and our dates went on this monstrosity. He and his date in one bullet, I and my date in the other bullet. The ride operator thought it would be cute to stop the Bullet Ride in mid-air and go on a coffee break and leave us stuck between heaven and hell. My date thought it was cute and romantic and was trying to instigate a little “pitch and woo” while I am in total panic mode yelling at her not to move and to get away from me, while screaming at the ride operator, telling him that he wasn’t funny and to get us down. The operator was probably gone for no more than 5 minutes but it seemed like an hour. He came back, muttered something about someone being a big baby and let us off the ride. At the conclusion of the ride, I still hated heights, but now added the ride guy and my date to the list. This is the exact position the ride operator left us in for an hour and a half…or 2-3 minutes, depending on who you talk to. As the cage we were in was doing lots of sliding around and turning me into a pale, white knuckled zombie, the two kids are doing everything that they can to make the thing rock and slide even more. Somewhere during the ride, the mother pointed out that her husband was standing on the pier, stating that he was afraid to come on the ride. I think the man was a genius. This Ferris wheel ride was total revenge on the part of the wife because I got her to ride her least favorite type of ride, one that gets people wet. California Adventure has just such a ride, the Grizzly River Ride. It wasn’t totally me who made her ride the ride, it was also a couple of young kids. These two kids, a brother and sister, were in line in front of us. They were soaked. The lines were so small for the ride that as soon as they got off the ride, it was possible to run around to the entrance and get on the ride again. They gleefully informed us that they had already ridden the ride 7 times, that it was the greatest ride ever. These two little evil munchkins convinced the wife, no…shamed the wife into coming on the ride with me and them . The raft has a wheel in the middle that passengers can turn to make the raft spin. These kids were spinning that wheel like they were on Mr. Toad’s Wild Ride, laughing and screaming all the way down the mountain. Needless to say, the wife got drenched, the kids were ecstatic, and I hoped that the wife had broadened her horizon and outlook on life. With the help and encouragement from the children of the corn, I even drug her on a second trip down the rapids. After all, there was no waiting in line, she was already soaked, and it was raining anyway, and did she want to disappoint these two cute, wonderful little cherubs who think of you as their new mom. In all the excitement, I forgot that the wife will always, I mean always, get her revenge. After the ride, I am ready to go back to the hotel, but she says she wants to do just ONE more ride. So we walked to the pier towards the giant ferris wheel, her leading me on like the condemned prisoner to the gallows. At one point I did say, “you know I don’t like Ferris wheels.” To which she replied, “and you know I don’t like “get wet” rides.” The sound I heard at that moment was the big clang of the door being shut, sealing my fate. I have heard from other people who have gone to Disneyland at Christmas that it was really crowded and the waits for the rides were as long as the lines in the summer. So maybe out time there was an anomaly, but the way I look at is this: 45 minutes in line under the summer sun has got to be worse than 45 minutes under the winter sky. We are planning to make the trip again this winter. Brochure description of the two rides, The word “fun” I believe, is open to interpretation. 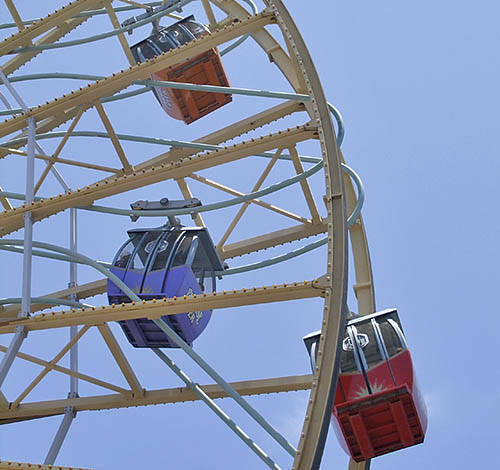 150-foot-tall Ferris wheel is really a ride within a ride. As the gondolas are raised by the wheel, they also slide along interior curves as the wheel turns – or take a red car for a tamer ride. 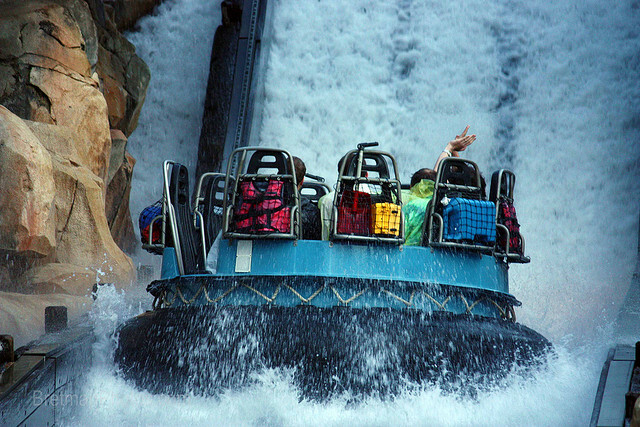 long, tall, fast, spinning white-water river rafting ride. You WILL get wet.